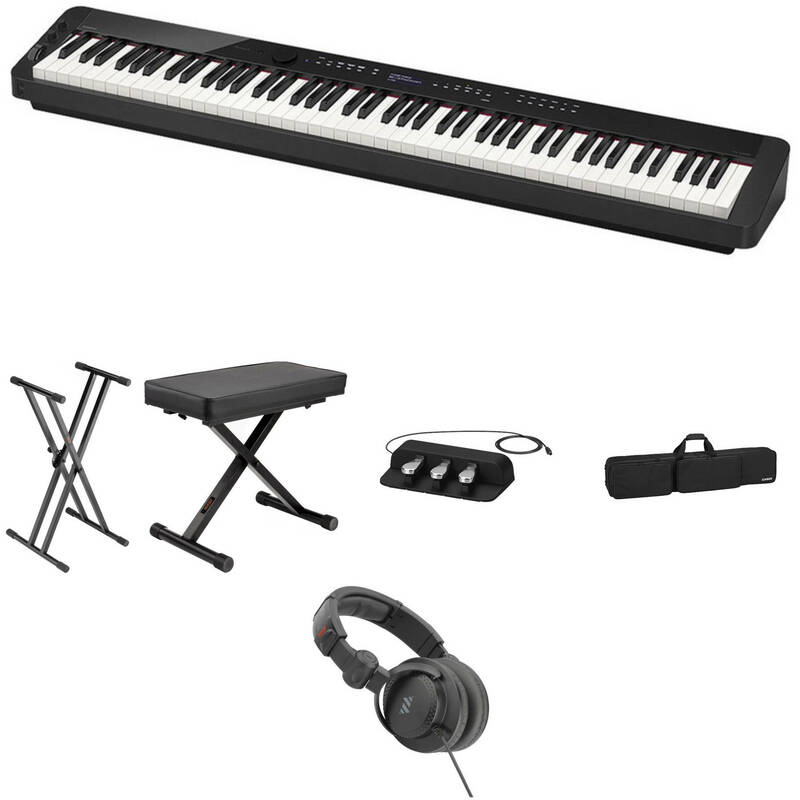 The black Casio PX-S3000 Digital Piano Essentials Stage Bundle Kit from B&H includes the PX-S3000BK Privia 88-Key Digital Piano, Auray KSPL-2X Double-X Keyboard Stand, Auray PBS-24 X-Style Piano Bench, SP-34 Triple Pedal, SC-800 Keyboard Case, AC Power Adapter, music stand, SP-3 Sustain Pedal, and Polsen HPC-A30 Closed-Back Studio Monitor Headphones. This kit can be used for live stage and theater applications and offers string resonance, damper resonance, and key-action noise to offer grand piano sounds, electric pianos, organs, strings, and harpsichord sounds with seamless transitions and excellent dynamic range. The black Privia PX-S3000 Digital Piano from Casio features a scaled, hammer-action keyboard that provides built-in speakers, 700 built-in tones, and 200 rhythms with layer, split, and duet modes. It's designed to fit in any room, with any decor, and fits any mood. Five Sensitivity levels, 192-note maximum polyphony, and an acoustic simulator result in string resonance, damper resonance, and key-action noise to offer a grand piano sound with seamless transitions and excellent dynamic range. Along with the grand piano sound in the Privia keyboard, you'll also find synths, saxophones, flutes, lifelike tine and reed electric pianos, organs, strings, vibraphone, and harpsichord sounds. It is equipped with digital effects like reverb, surround, chorus, and preset DSP for some tones. Additional features include connectivity to Chordana Play for Piano (download), Bluetooth audio, a 2-track recorder, pitch-bend, octave shift, metronome, and equal temperament variations with key-transpose functions. Furthermore, two headphones, three pedal connectors (damper, expression/assignable, and additional pedal unit), and USB audio and Host connections are featured on the back of the unit. An AC adapter is included with the option to use six AA alkaline batteries to power the unit. An SP-3 pedal and a music stand are also included. The PX-S3000's design fits any room, any decor, and any mood. The black finish, its sleek, glossy panel, and unibody case evokes an acoustic grand, all in a case that's barely larger than the keys themselves. The touch of the PX-S3000 is due to the updated and designed fully weighted, smart-scaled, hammer-action keyboard, which delivers an authentic and uncompromising piano touch with an incredibly small footprint. Casio's proprietary key-scaling system reproduces the individual characteristics of each of the 88 keys, while ebony and ivory key textures ensure confident playing in any climate. The PX-S3000 includes 700 tones including a breathtaking acoustic grand piano. Advanced string resonance exposes the harmonic relationships between vibrating strings, while damper resonance adds depth and richness. You'll even hear the damper rise and fall when the pedal is pressed, along with the subtle mechanical sound of the keys being played and returning to their original position. Hammer response and key-off simulation deliver even greater detail, reacting naturally to your playing dynamics. With the PX-S3000, piano is just the beginning. Play an electric piano, hear vintage phasers and amplifier models that take you back in time. Play a flute, trumpet, or saxophone, and hear natural breath and vibrato. Play a bass, synth, drums, and more. In each category, you'll find a variety of lifelike instruments. With hundreds of built-in rhythms, you'll always have a band ready to jam. The variety of rhythms spans the globe as well as the history of popular music. You'll find old favorites and chart-topping hits, all played with realistic instruments that sound better than ever. The drum kits come alive with authentic acoustic drums, vintage drum machine sounds, and a huge collection of percussion instruments and sound effects. The PX-S3000's touch sensor controls are revealed only when the power button is pressed and are easy to see and use in any light. They fade away when powered off, leaving only a clean, seamless top panel. Integrated Bluetooth audio lets you connect your device wirelessly to the PX-S3000, playing your music through its powerful stereo amplification system. Now, instead of just enjoying your favorite music, you can join the band. A stereo speaker system delivers crystal-clear sound for both the player and the audience and is engineered to sound accurate when facing a wall, placed on a table, or in an open performance space. The speakers project towards the player from subtle ports just above the keys and towards the audience from rear-facing drivers protected by a beautifully designed grill. Two headphone jacks allow quiet play at any time. The PX-S3000's newly developed Sound Mode gives your playing new perspective. You can select from four types of Hall Simulations to place your PX-S3000 in the virtual concert space of your dreams. Privia pianos are already known for replicating grand piano sound and feel in a compact package, but the PX-S3000 will make you rethink how portable a piano can be. They are 43% smaller than previous generation Privias and take up literally less than half as much space as their competition, while retaining true piano touch and sound. It goes anywhere you need a piano: on a table; on a counter; on a desk; on your bed; the list goes on. Weighing under 25 pounds and coming with optional 6 x AA battery power, the possibilities are endless. Download the free Chordana Play for Piano app (available on Google Play and the iTunes Store) and customize your PX-S3000 to suit your mood. Change instrument settings, control the MIDI recorder, and interact with MIDI files from your favorite device. View PDF scores, and use the optional SP-34 3-pedal unit (or third-party Bluetooth-compatible pedals) to turn pages when playing. You can even learn your favorite songs with a graphical piano roll which grades you on how well you play. The PX-S3000 is also an ideal master controller for your home studio. It's more affordable than most dedicated 88-key MIDI controllers, delivers a piano feel, and includes a collection of studio-quality sounds. Best of all, it fits easily into any desk designed to hold an 88-note instrument with room to spare. Class-compliant USB means you can connect to any Mac/Windows/iOS/Android device with no drivers or installation needed. When it's time to play out, the PX-3000's lightweight, slim design will make you wonder why you ever used anything else. The optional carrying case (sold separately) includes space for the PX-S3000, its music rest, and a portable SP-34-pedal unit (sold separately). Connect via left & right 1/4" outputs to any amplification or recording destination. Like all Privia instruments, the PX-S3000 features Duet mode, which splits the keys into two equal pitch ranges for performances or educational settings. A teacher and student, or two students, can be seated at the same instrument. The PX-S3000's Duet mode also has a pan feature, which allows true two-student-per-instrument compatibility with all popular piano-lab systems. The large black Auray PBS-24 is a lightweight X-style piano bench designed to provide stability, comfort, and support for keyboardists and pianists on stage, at home and rehearsals, or in the studio. Its strong steel frame supports a weight capacity of up to 240 lb. Courtesy of four height positions, the bench can be adjusted from 19 to 25” tall. The 24 x 12” seat features 3” of high-density foam for padding that offers both comfort and support, even for long sessions. Setup is simple and quick due to the double spring-loaded locks and X-style design, which folds flat to minimize space during transport and storage. Four positions yield a height range from 19 to 25"
The SP-34 Triple Pedal from Casio is designed for Casio's PX-S1000 and PX-S3000 Privia digital pianos. It can be used to configure sustain, soft, and sostenuto pedal functions and has an extended damper function that simulates the response of a half-pressed pedal on acoustic grand pianos. The SC-800 Keyboard Case from Casio is a slimline, water-repellent, nylon softcase for the PX-S1000 and PX-S3000 Privia digital pianos. It can be used to transport the 88-note keyboard and is built with two zippered pouches on the front for accessories and cables. It is equipped with a durable carry handle. Box Dimensions (LxWxH) 57.5 x 12.0 x 7.5"
Box Dimensions (LxWxH) 31.0 x 13.5 x 6.5"
Box Dimensions (LxWxH) 16.3 x 7.7 x 4.5"
Box Dimensions (LxWxH) 55.5 x 12.75 x 7.5"